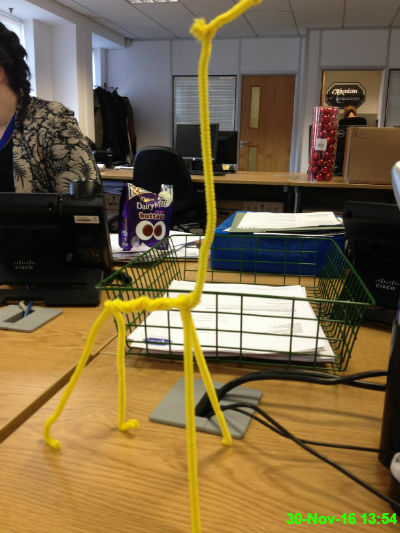 Behold the majesty of my pipe cleaner giraffe. 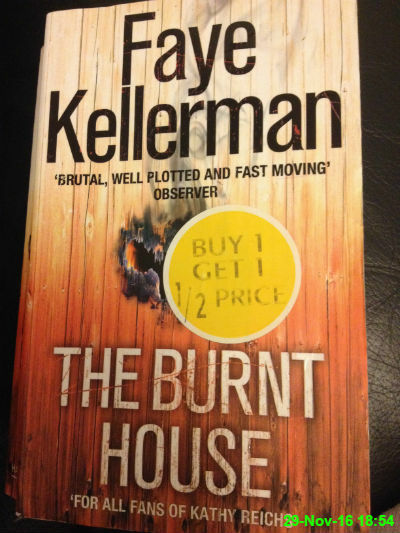 I must have read this before because I found it in my own spare bedroom, but I have no recollection of what happens so I'm happily reading it again. 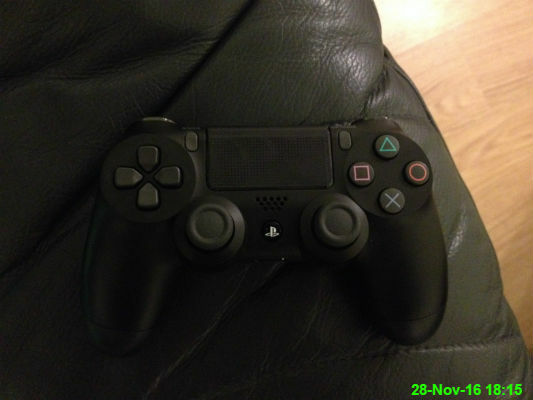 Michael got a new Playstation recently and the controller looks different to what I'm used to. 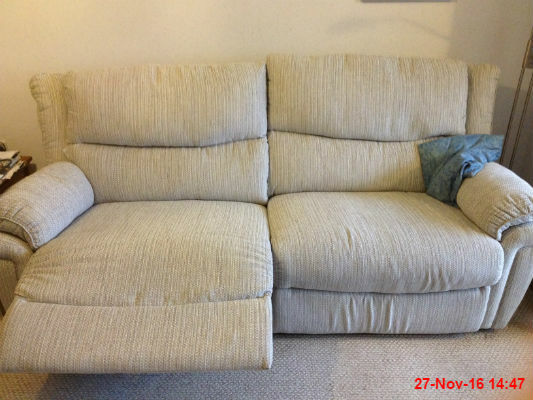 After dinner I had to try out Mam and Chris' new settee and make sure the recliner worked properly! Clockwise from the left: Paul, Sam, Michael, Matty, James, Olly and Kasper. The hair at the bottom of the picture belongs to Lucas. 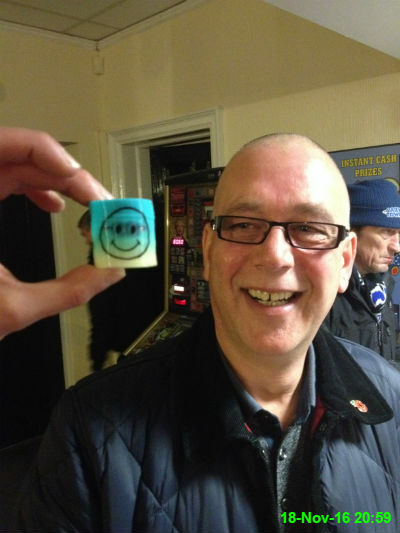 We were having a few drinks to cheer up after Newcastle lost 1-0 against Blackburn. 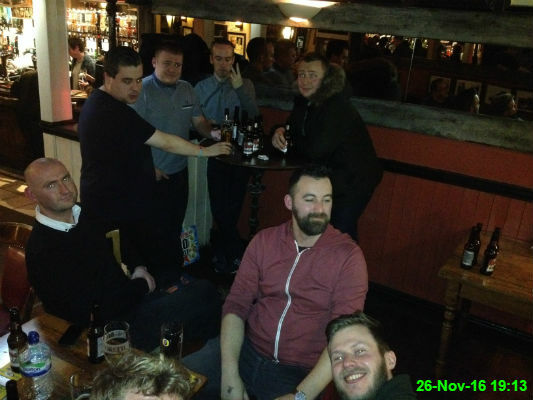 We went to Barluga for a Christmas meal with people from our Edinburgh and Glasgow offices. 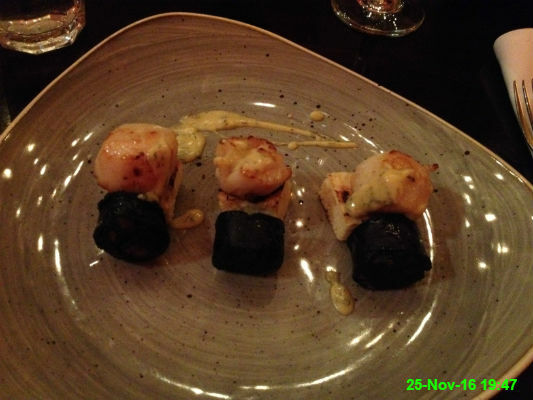 My starter was scallops with black pudding. 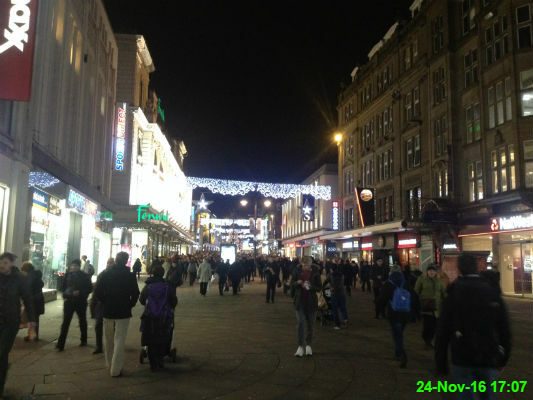 Northumberland Street is looking quite festive already. 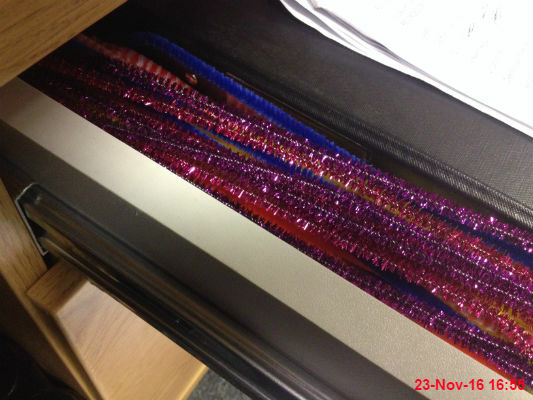 I'm a born fidget so 80 pipe cleaners for �is a dream come true for me. I was in the mood to buy some new clothes so I tried some stuff on. 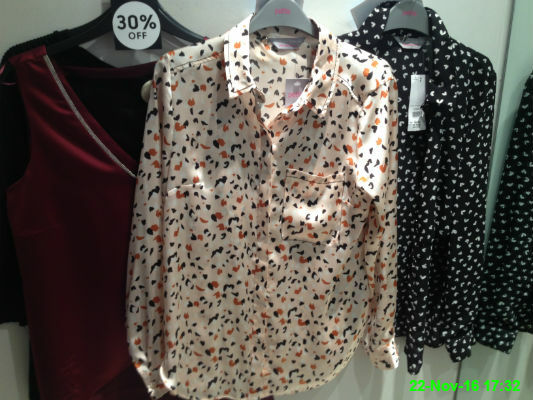 I ended up buying the tops on the left and in the middle. 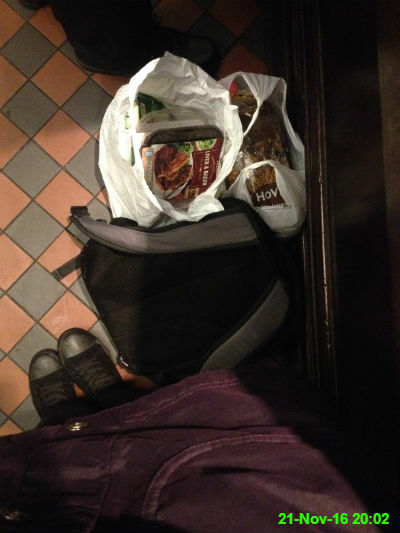 After finishing my shopping it was freezing cold and pouring down with rain, so rather than wait 15 minutes for the bus out in the cold I took shelter in the Black Garter and listened to the karaoke. 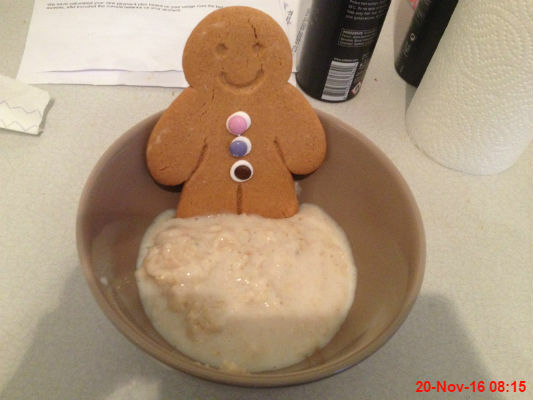 I warmed the toes of my gingerbread man in some porridge before I bit them off. 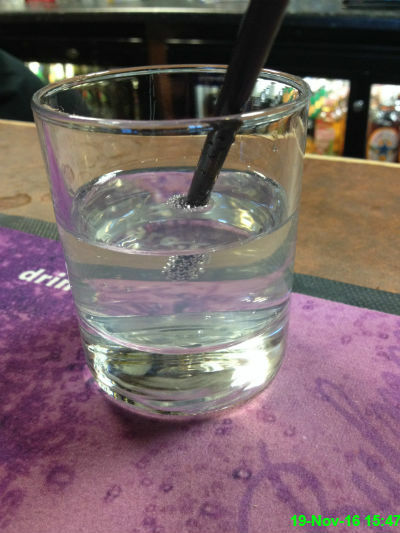 I was roundly mocked when I suggested that vodka, lemonade and white chocolate syrup would be really nice. Hollie mixed one up and it was amazing! Like an alcoholic milky bar. The smiley face on this slinky reminded me of Malcolm so we attempted to add some glasses. It came out looking like Donatello from the Teenage Mutant Ninja Turtles. 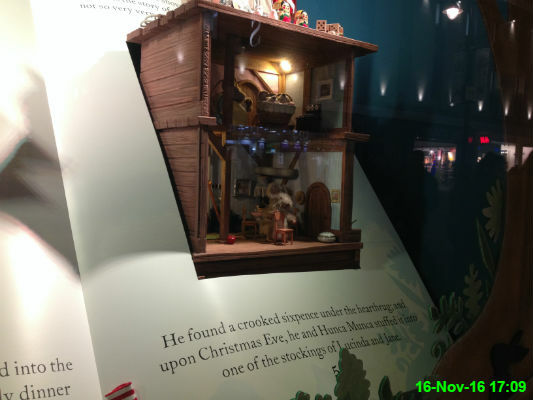 This year Fenwick's window is inspired by the 150th anniversary of anniversary of children's author Beatrix Potter. I grew up reading her tales of Peter Rabbit, Jemima Puddle-Duck, Mrs Tiggy-Winkle and all the others. 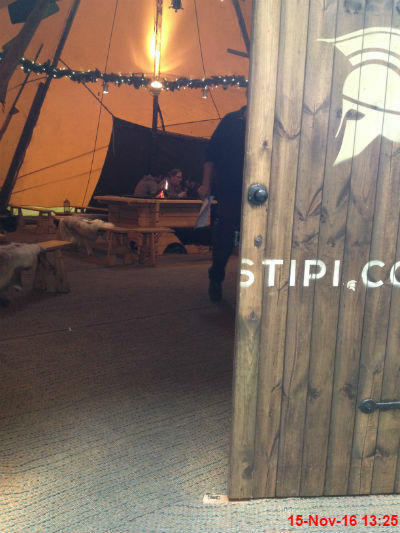 Here's a glimpse inside the temporary food/drink tent that has been put up near Central Station. At around �each for a pint and a frankfurter, we didn't bother staying around long enough to spend anything. I liked the little fire in the middle of one of the tables, but that was about it. 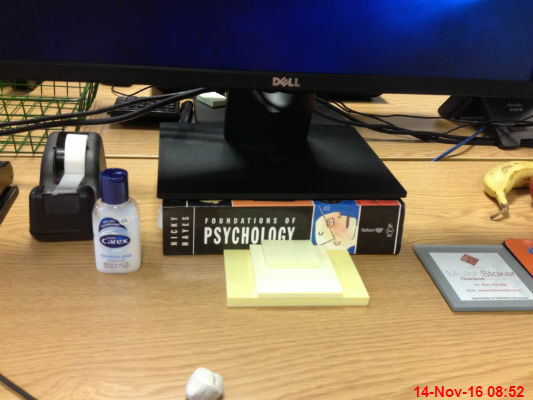 I've been thinking my screen at work was a little too low, so I dug out my thickest textbook to raise it up a bit. If there's one thing I love it's a rubbish tattoo and this is the worst I've seen in a while. 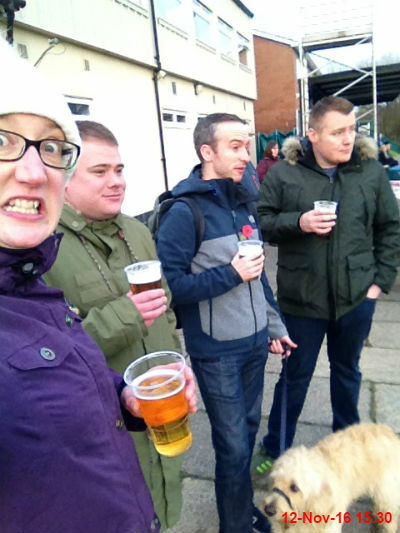 For the first time in ages I had a Saturday afternoon matchday with Michael, Matty and James (plus Archie the labradoodle). It's an international weekend so we went to West Allotment Celtic v Jarrow Roofing, which finished 2-1 to the hosts. 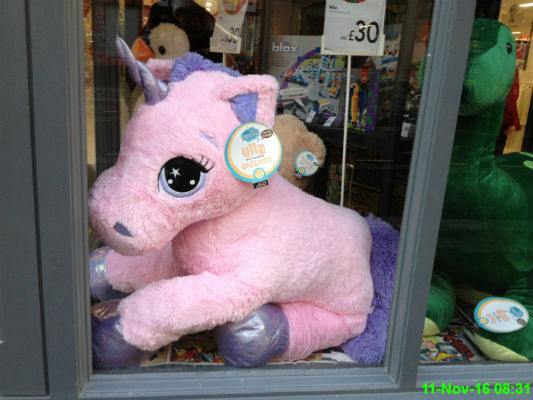 The child in me needs to own this gigantic stuffed unicorn. And also the gigantic stuffed dinosaur next to it. 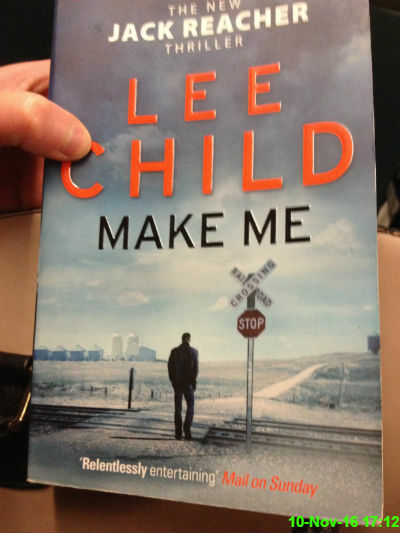 I always had it in my head that I didn't like the Jack Reacher novels but I'm enjoying this one. 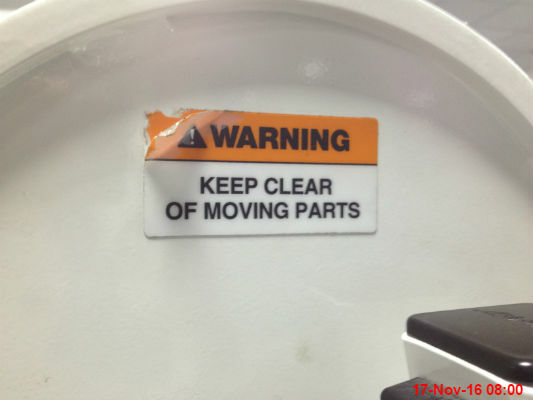 Maybe I'll have to go back and read the rest of them. 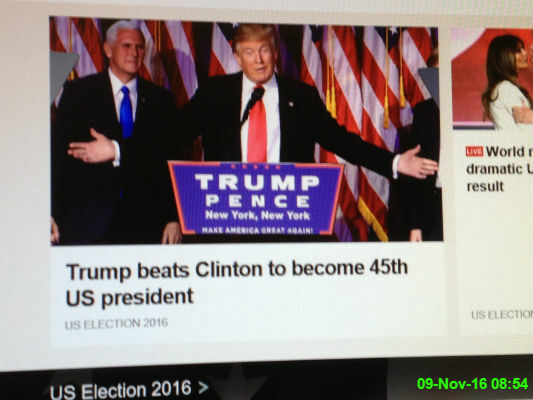 I woke up to find out that Donald Trump has beaten Hillary Clinton in the race to become the next President of the US. It seems like an absolute disaster as far as I'm concerned, though I'm by no means a Clinton fan either. 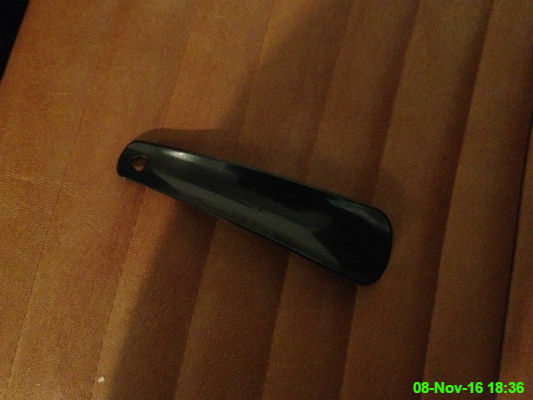 I've never used one of these before. I just.. buy shoes that fit? 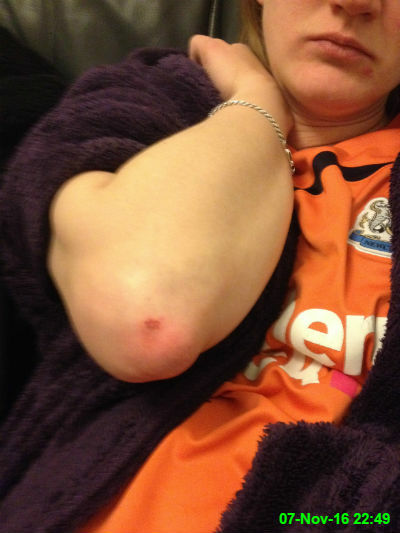 It's been a while since I injured myself through my own clumsiness, but I made up for that today by slipping on the stairs and bashing my elbow. It's now developing a delightfully coloured bruise. 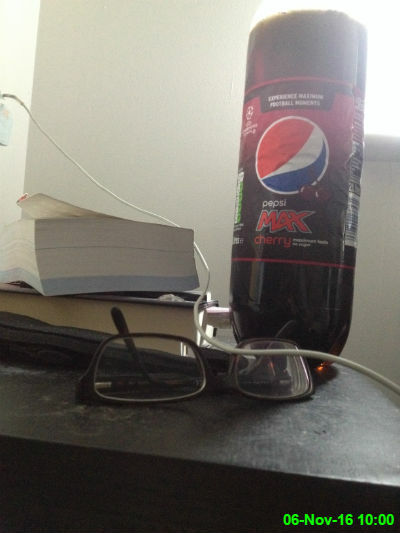 I was pleased to wake up and see a large bottle of Pepsi Max next to my glasses on my bedside table, since I was pretty thirsty after a nice hot Ocean Road curry last night. 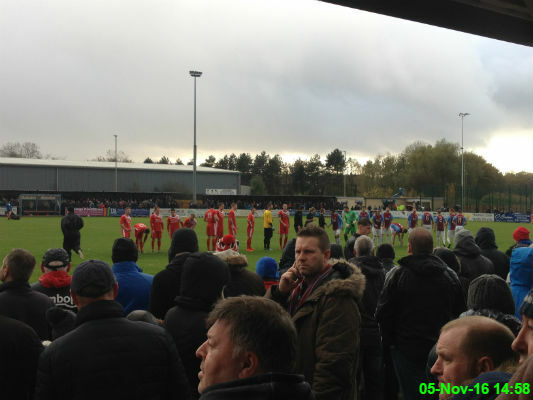 It was a very wet afternoon but worth the trip as North Shields came out victorious. 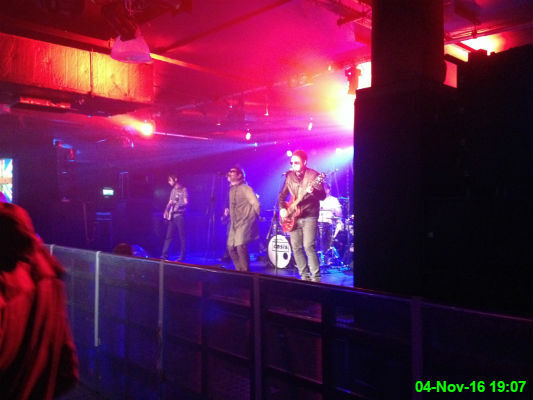 I went to Newcastle University to see Definitely Oasis and The Complete Stone Roses. I'm sure you can guess what sort of music they play! 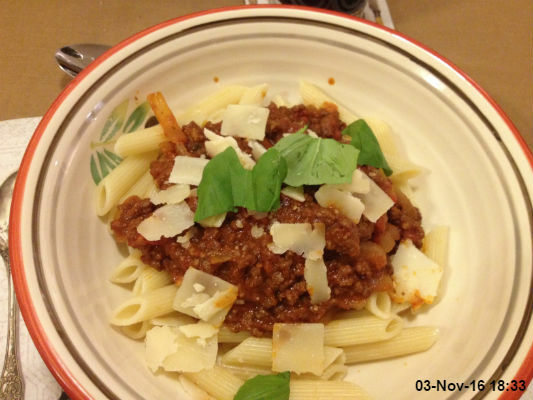 After a busy day, I can't think of many better ways to relax than with some good company and Chris' lovely bolognese, which was topped with basil and parmesan shavings. 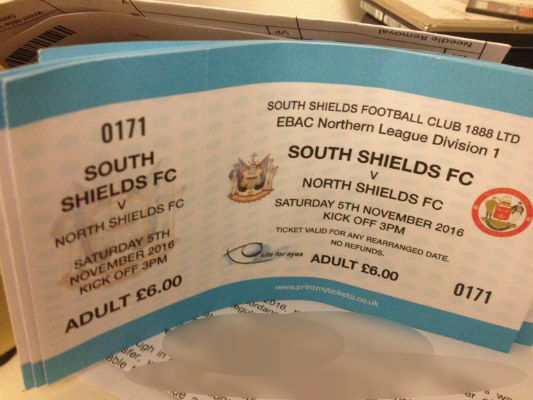 Once again South Shields are scheduled to play North Shields in a derby match. We have tickets for the match, which should be a tasty affair as it is 1st v 2nd in the league. Our plans will also include a curry on the famous Ocean Road. Apologies for the hideous editing, but there was some writing on the letter below that is probably confidential. 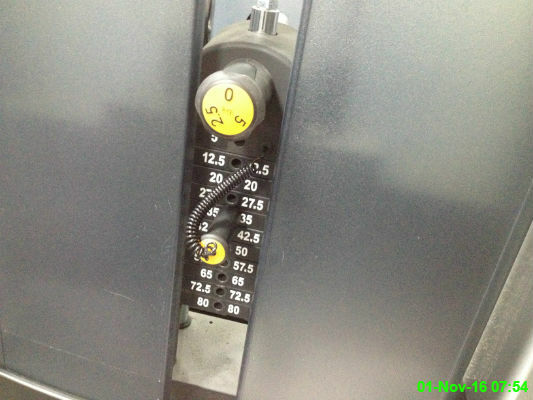 The newer machines at the gym have settings which are great for progression as you can increase weight by a few kilograms at a time. It's pretty demoralising when the next option is 5-7kg heavier and you fail miserably.